Our goal is to provide tools and techniques to enable owners, trimmers, farriers, and veterinarians to provide valid evidence-based hoof care. Given the unique factors that affect hoof care, we believe it is important to measure hooves. Routinely measuring the hoof provides a means to learn and to train the eye. It also becomes possible to keep meaningful long term records on hoof conformation. If the horse is working really well, and is comfortable and sound, it might be a good idea to measure the hoof to record the exact angles, lengths, and other measures that make that particular horse happy. Then, a few months or years down the road when, for seemingly mysterious reasons, the same horse is uncomfortable or even lame, it will be possible to take new measurements, and compare to the values recorded when the horse was comfortable. For a multitude of reasons, it is typical for horse owners to change hoof care practitioners fairly often. In such situations, having reliable records of a horse's hooves is invaluable. It will give good trimming and shoeing guidelines to the new practitioner, give peace of mind to the horse owner, and help protect the well-being of the horse. Although proponents of measuring, we are not proponents of stating ideal values, percentages, or ratios. The best use of measuring is on an animal-by-animal basis, looking for changes over time, and learning which values work best for a given individual. That said, we certainly do believe in 'normal ranges' for various measurements -- that is, there is a 'bell curve' with a mean and a standard deviation for most any measurement over a population of hooves. Fig 1: The true height of the heel is 1.27” as shown in image B. But if a label on the side of the block is used for calibration, the height becomes 1.08” as shown in image A. When comparing heel height over time, accurate measurements are required, and it is very convenient if the measurements don’t depend on how far away the camera was held. Some care must be taken in order to make an accurate measurement of a physical object in photographs or radiographs. 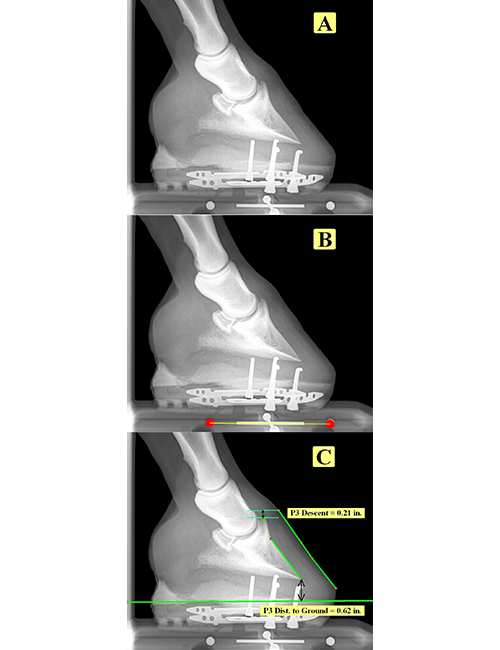 It is not rocket science – it is routinely done in many industrial and scientific applications, and it is well proven that very accurate measurements can be made from hoof images. However, to achieve such accuracy requires some form of calibration, usually based on some kind of a scale marker that is placed in the image at the time the image is taken. Although such schemes are well understood in science and industry, they are often not in use by veterinarians or by hoof care practitioners. The vast majority of radiographs and digital photographs of the hoof are therefore not appropriate for making accurate measurements since they lack accurate calibration. For lateral and frontal hoof photos of the hoof, we offer the “Metron Block” which has a built-in scaling system on its sides. Two calibration points are on the outer surface of the block and two more calibration points are in wells that go into the block and under the foot. When these four points are picked in the Metron software, all measurements are computed accurately along the centerline of the block. By using this “four point calibration” scheme, the Metron block allows the camera to be held at any distance from the block without affecting the accuracy of measurements in the image. Using the four points, and the known geometry of the block the Metron software compensates for the focal length of the camera and always provide true measurements in the vertical plane at the centerline of the block. Fig 2: In the original radiograph (A), the metal scale marker built into the block can be seen. In (B) it has been automatically located by the Metron software, which uses it to scale the image so that measurements (C) can be made accurately in the image. Fig 3: There can be as much as 20% error in measurements made in radiographs that have not been calibrated. (B) shows the true length of 1.44”, whereas (A) has the magnified value of 1.73”. It is helpful to know the real number before trimming or other procedures! Without careful consideration of calibration, it is not possible to measure things accurately in a radiograph. There are several ways to calibrate radiographs -- but the easiest and most accurate is to have a marker of known length located in the right place when the image is taken. The Metron Block has metal items within it that will become apparent in a radiograph (figure 2.) The Metron software automatically locates this metal scale marker, and then uses it to calibrate the image. The combination of the Metron Block and the EponaCam system make taking quality hoof photos simple. The same blocks also are used by veterinarians to take accurately scaled radiographs.